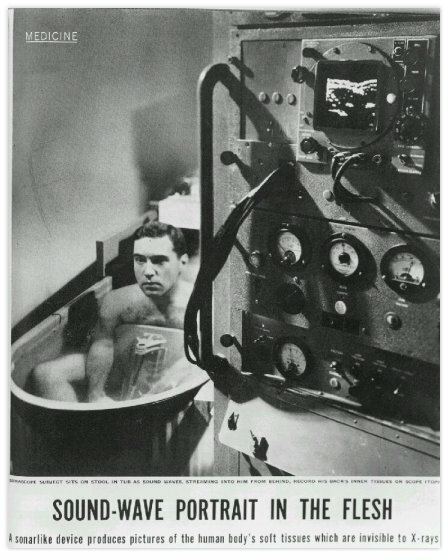 The original Somascope from Howry, Bliss, Posakony and Cushman as appearing in the Medicine section of the Life Magazine® in 1954. The Somascope is a water immersion motorised B-mode scanner. This picture showed the system in operation. Posakony was the subject and his scanned kidney can be seen on the oscilloscope screen. 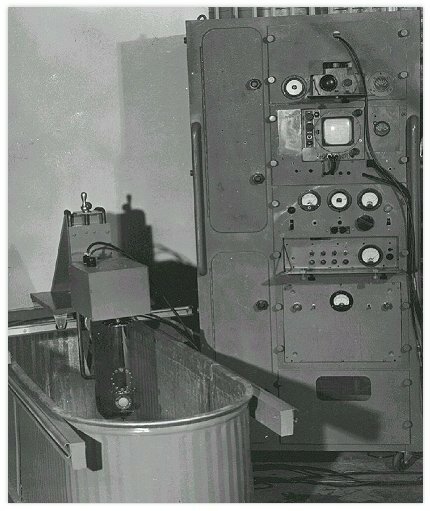 The Somascope was only considered as experimental at that time. See caption to the picture. 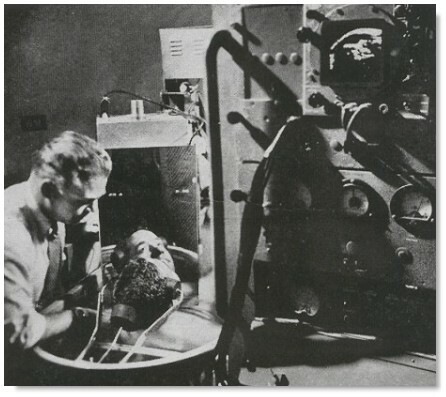 Dr. Douglass Howry working on the Somascope in making a scan of the head. A mirror was infront of the face of the subject. G. J. Posakony did most of the mechanical, acoustic and transducer design as well as some of electronics, and C. R. Cushman did most of the electronics layout and constructions. The picture showed the converted radar frame and the horse trough to which the rails are adapted. Of most significance is the tube holding the transducer. This was a focused transducer made of lithium sulfate. It had a fairly narrow beam and a broad bandwidth signal response which allowed for high axial and lateral resolution. The transducer head could be in moved linearly back and forth or it could oscillate back in a polar rotation over about 120 degree angle or it could do both. This latter consideration allowed visualization of biological structures that where in the field of view of the sound beam. * Notes and images courteously provided by Mr. Gerald J Posakony. Reproduced with permission.